July 1, 2014 -To follow the footsteps of the Spanish conquistadors who came to North America some 500 years ago, sometimes water routes are necessary. 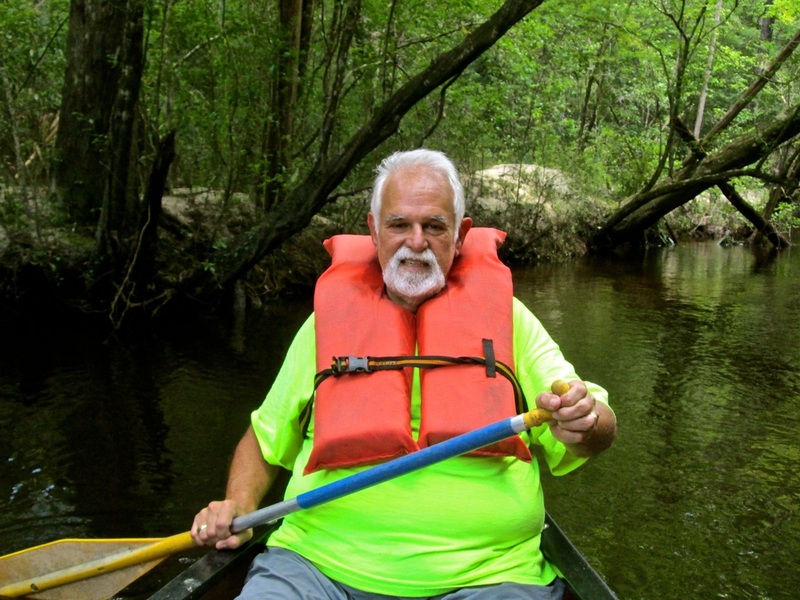 And that's how I found myself rowing on the Econfina Creek in northwest Florida. 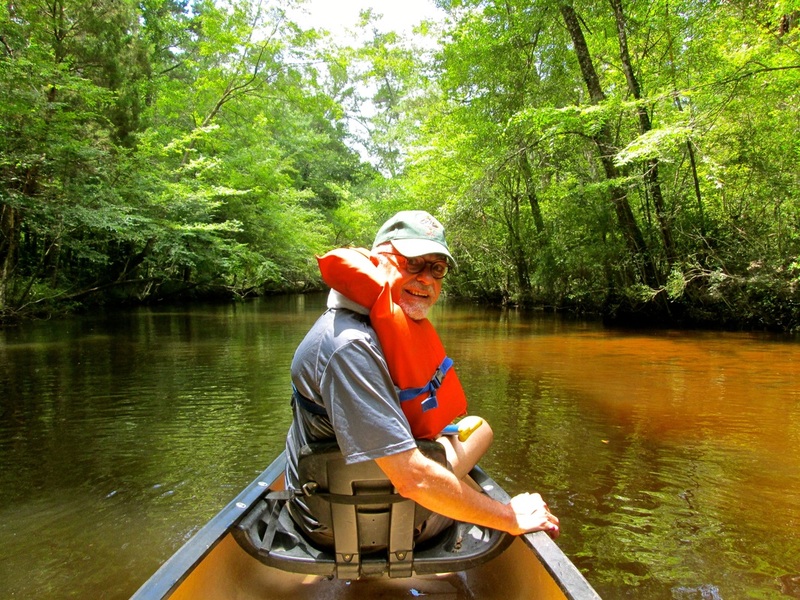 After seeing how the Panfilo de Narvaez expedition reached Florida in 1528 — from a modern deck boat that landed in St. Petersburg — I also wanted to see how some of its survivors escaped Florida and the arrows of its natives, this time from the perspective of a canoe! "During that time, some of the party went to the coves and inlets for seafood, and the Indians surprised them twice, killing 10 of our men in plain view of the camp, without our being able to prevent it," wrote one of the survivors, Alvar Nunez Cabeza de Vaca. "We found them shot through and through with arrows, for, although several wore good armor, it was not sufficient to protect them, since, as I said before, they shot their arrows with such force and precision ... "
The conquistadors escaped from that area on Indian canoes and barges they built to make their way back to the Gulf of Mexico. "We sailed seven days among those inlets, in the water waist deep, without signs of anything like the coast," Cabeza de Vaca reported in his 1542 book, "La Relacion" ( The Account). And when they finally reached the Gulf, many of them — including de Narvaez — were swept away by strong currents, never to be seen again. 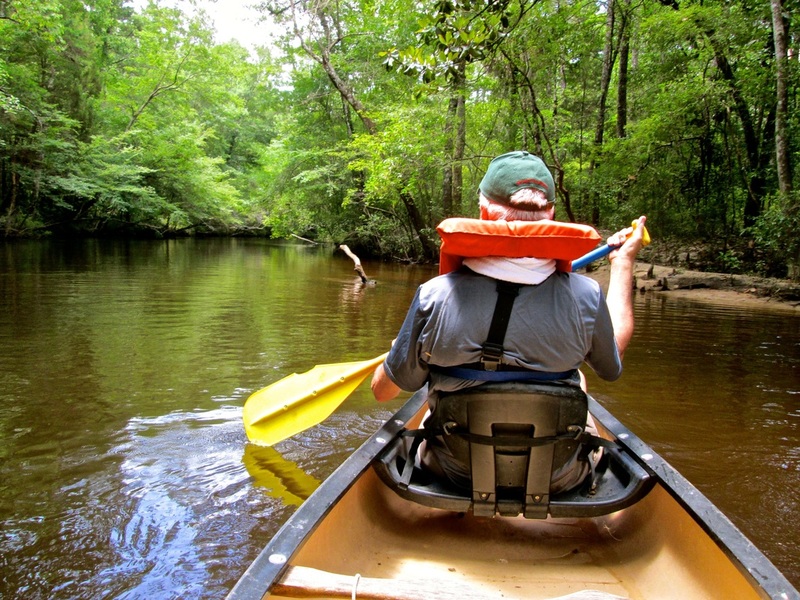 I did it for four hours, on a rented canoe, and covered only seven miles of their creek journey, never reaching the Gulf. I only had to worry about mosquitos, spiders that kept falling off the trees and into the canoe, water moccasins, and heat exhaustion. But my friend and travel companion Gustavo Villageliu kept putting it in proper context. "If you think this is hard," Gustavo kept repeating, "imagine doing this with arrows coming at you from both sides of the creek." Yet that was the reason we were there! While others were frolicking in Florida wildlife, we were going back in time to gain a better understanding of the hardships endured by North America's first European explorers. 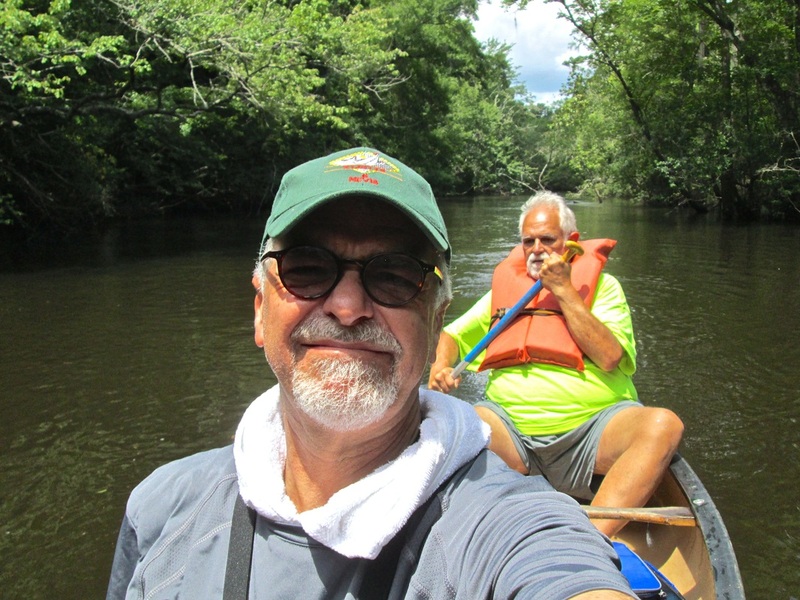 For those who also want to imagine what that was like, I've posted a short video of our canoe journey on my Hidden Hispanic Heritage Facebook blog (facebook.com/HiddenHispanicHeritage), and on this page. 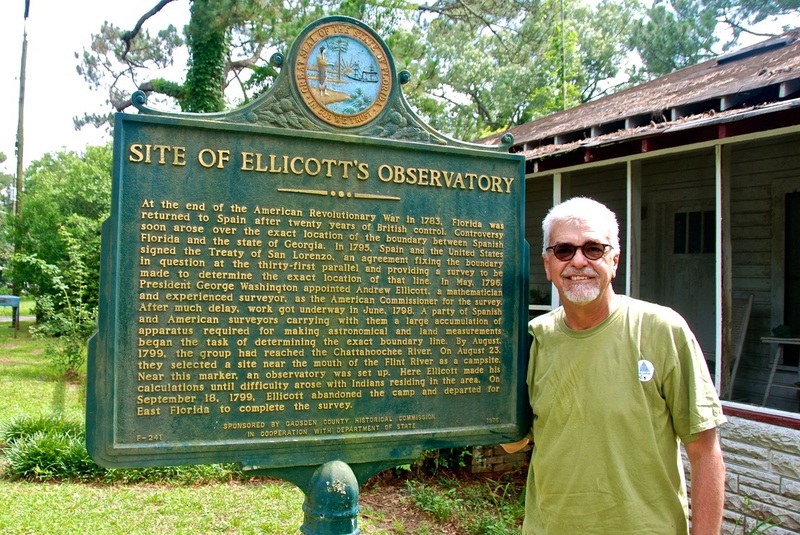 But it was time to continue on the Great Hispanic American History Tour, and nearby, on his smartphone's GPS, Gustavo had located the site of Ellicott's Observatory, where a sign explains that the border between Florida and Georgia has Hispanic roots. "At the end of the American Revolutionary War in 1783, Florida was returned to Spain after 20 years of British control," the sign says. "Controversy soon arose over the exact location of the boundary between Spanish Florida and the state of Georgia. In 1795, Spain and the United States signed the Treaty of San Lorenzo, an agreement fixing the boundary in question at the thirty-first parallel and providing a survey to be made to determine the exact location of that line. In May, 1796, President George Washington appointed Andrew Ellicot, a mathematician and experienced surveyor, as the American Commissioner for the survey. After much delay, work got underway in June, 1798. A party of Spanish and American surveyors carrying with them a large accumulation of apparatus required for making astronomical and land measurements began the task of determining the exact boundary line ... "
It was a quick roadside stop, but it proved that sometimes even our state boundary lines are part of our hidden Hispanic heritage. Gustavo and I took a few pictures and kept on moving because we were anxious to get to a treasure trove of Hispanic history in "America's First Settlement." No, not St. Augustine! Whenever I post photos of the Hispanic landmarks we have visited on this trip on our Facebook blog, someone always assumes that I must be in St. Augustine. 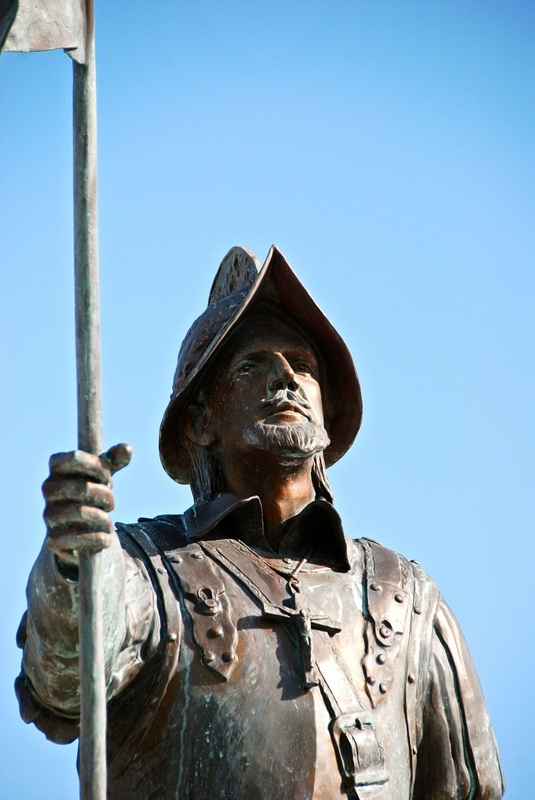 And whenever I post a photo of a conquistador statue, someone assumes it must be Ponce de Leon. Yet, although I have been to St. Augustine and written about its history many times, I have not gone there on this trip, because my quest is to make people see the hidden Hispanic heritage that is beyond St. Augustine and de Leon. 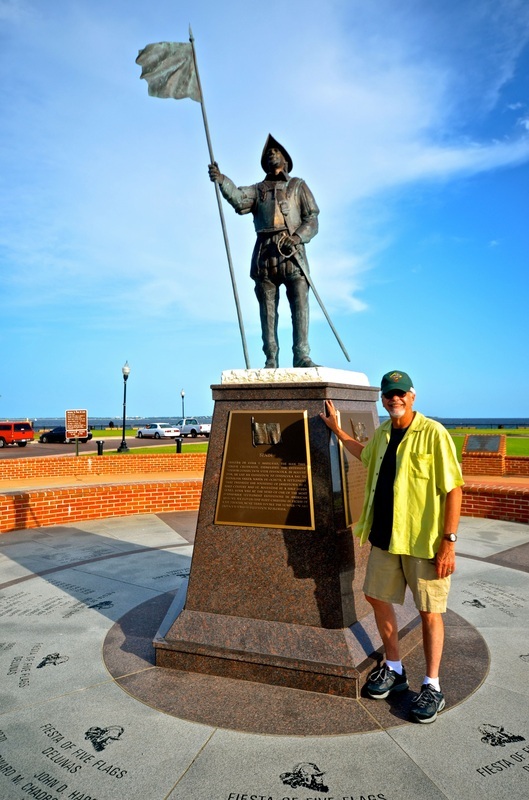 For the record: Although the first British colony, Jamestown, Virgina (1607), deceptively calls itself "America's Birthplace," and St. Augustine (1565), was established 42 years earlier, it is Pensacola, Florida (1559), that rightfully claims the title of "America's First Colony." 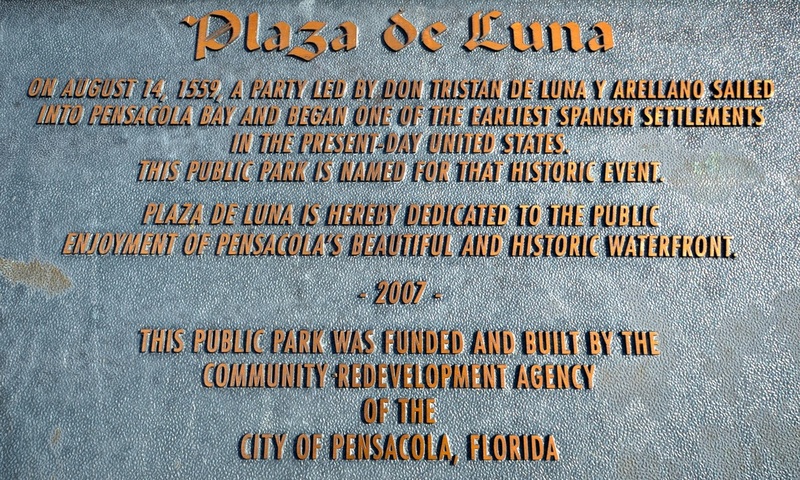 In Pensacola, Gustavo and I were pleased to find a city that proudly promotes its Hispanic heritage. 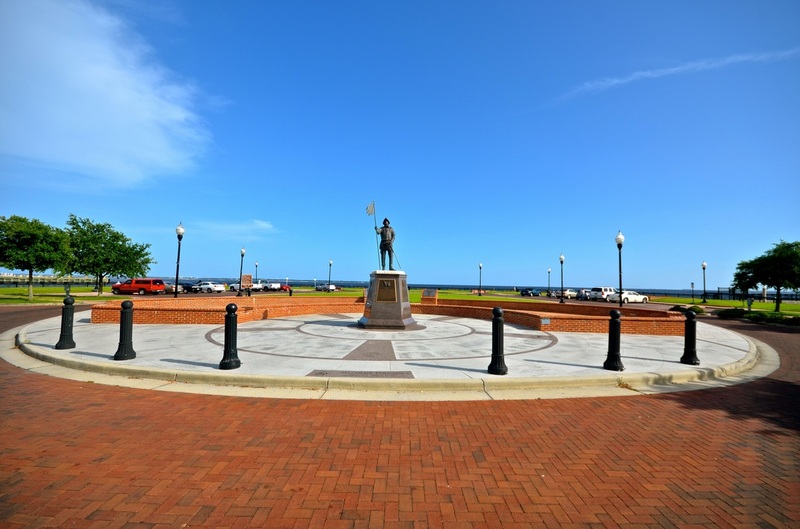 That's where you find an impressive statue of one of the lesser-known conquistadors, Tristan de Luna, in a beautiful plaza facing Pensacola Bay and a sign that explains why the city considers itself "America's First Settlement." 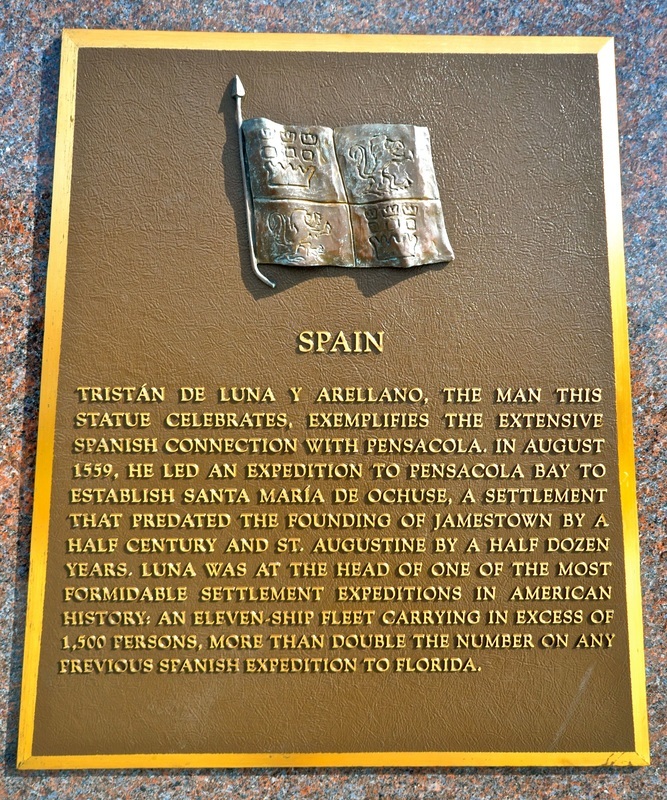 "In August 1559, an expedition led by Tristan de Luna y Arellano arrived in Pensacola Bay to establish Santa Maria de Ochuse, a settlement that predated the founding of Jamestown by a half century and St. Augustine by a half dozen years. Departing Veracruz on June 11, 1559, Luna was at the head of one of the most formidable settlement expeditions in American history: an 11-ship fleet carrying in excess of 1,500 persons, more than double the number of any previous Spanish expedition to Florida. Though the settlement failed in 1561, it was the longest-lasting colonial settlement up to that date in what is today the United States." That's where you get to understand that the course of American history might have gone in a different direction had it not been for a hurricane that nearly wiped out the de Luna expedition. "Shortly after arriving, and before a formal settlement could be established a hurricane struck Pensacola. The fierce storm destroyed most of the fleet and the supplies still on board, dealing the stranded expedition a blow from which it could not recover," according to an exhibit at the T.T. 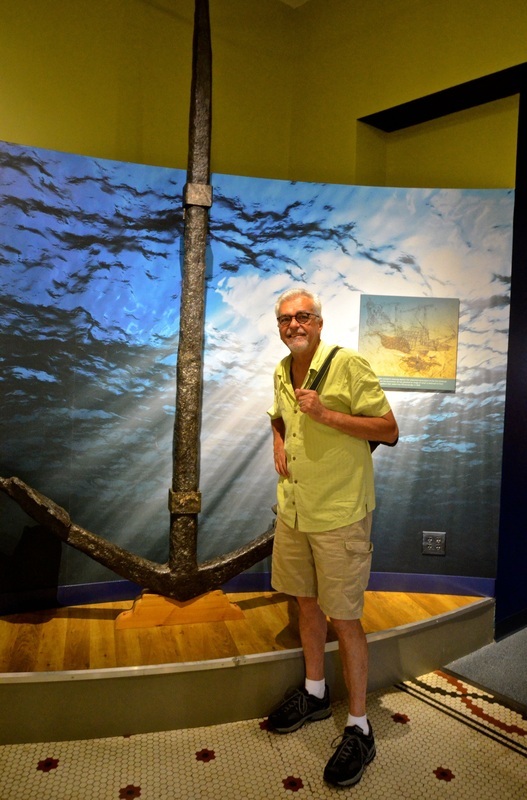 Wentworth, Jr. Florida State Museum in downtown Pensacola, where you can see the anchor from one of De Luna's ships, recovered in Pensacola Bay by a team of Florida state nautical archaeologists in 1992. "If the Luna settlement had succeeded, the story of America would have been much different," the exhibit concludes. But this is not the only time when the course of American history was diverted in Pensacola. 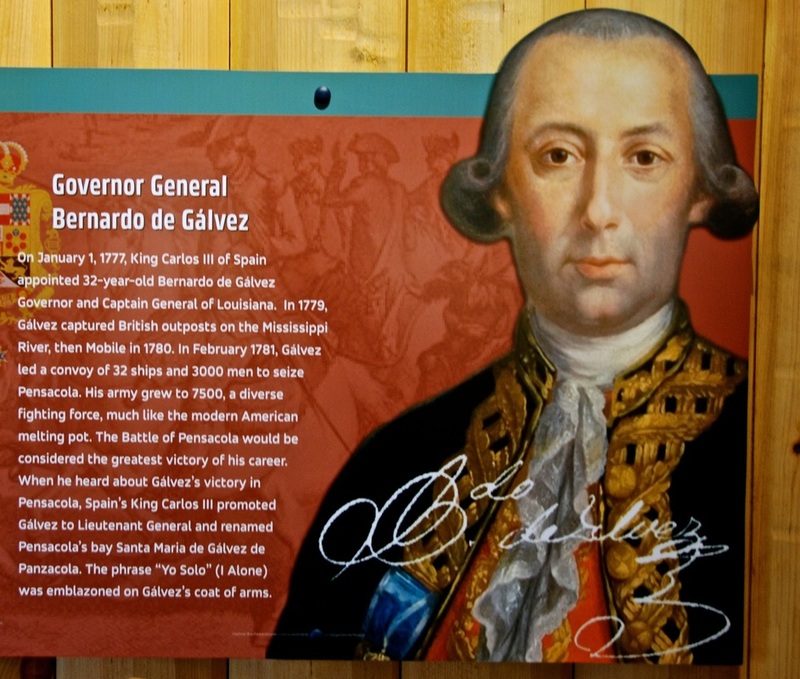 In the same museum, you learn all about how the Spanish army, under General Bernardo de Galvez and with many Latin American recruits, defeated the British at Fort George and turned the tide of the American Revolution. "By losing control of Pensacola, England lost its foothold on the Gulf of Mexico. With supply lines disrupted and troop movements severely hampered, the British could not effectively attack Washington from the rear. The outcome at Pensacola allowed General Washington to focus his resources on the war's eastern front." 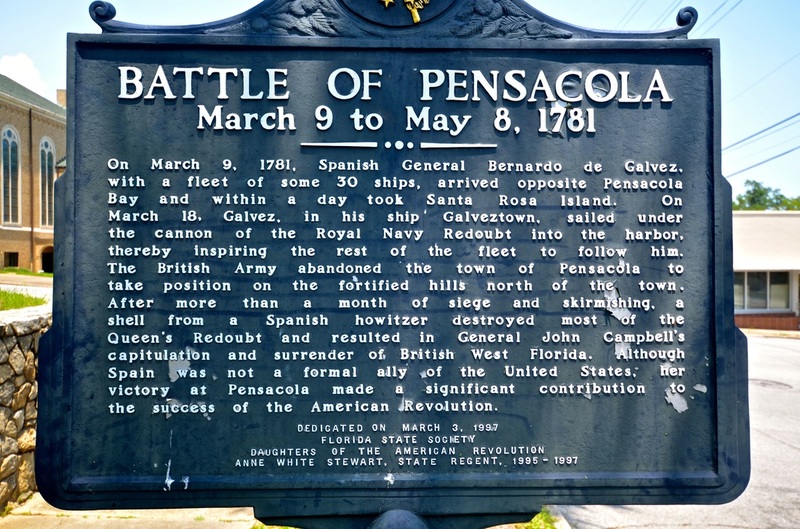 Although it is one of the least-known battles of the American Revolution, the Battle of Pensacola was a fierce, two-month military engagement. Galvez seized the city with 32 battleships and some 3,000 men. 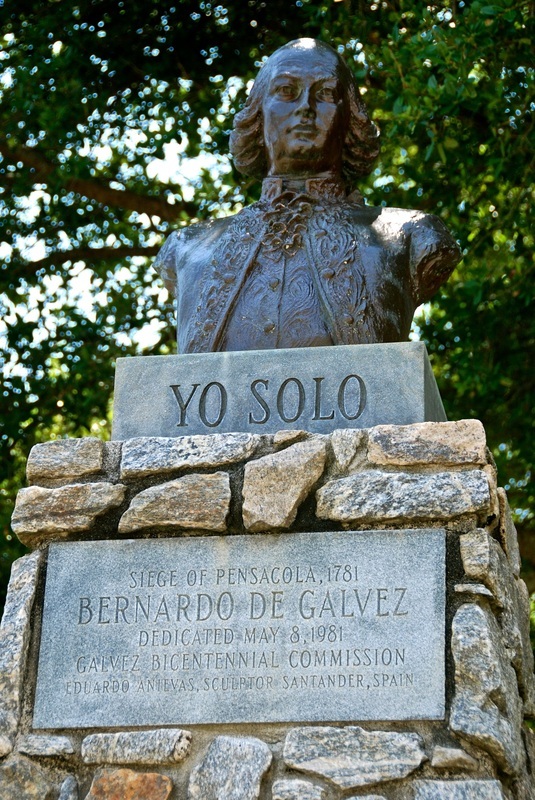 At Fort George Memorial Park, where a section of the fort has been reconstructed on its original foundation, a marker recognizes, "although Spain was not a formal ally of the United States, her victory at Pensacola made a significant contribution to the success of the American Revolution." And not far from there, we found Plaza Ferdinand VII, a national historic landmark recognizing the site where Spain — "unable to stem the tide of American expansionism," according to the Wentworth exhibit — formally transferred Florida to the United States for a measly $5 million in 1821. Heavily in debt and at the risk of losing Florida without compensation, Spain had no choice but to accept the deal. Of course, since I'm gathering more notes and photos than I have room to immediately display here, this is all fodder for many future columns. 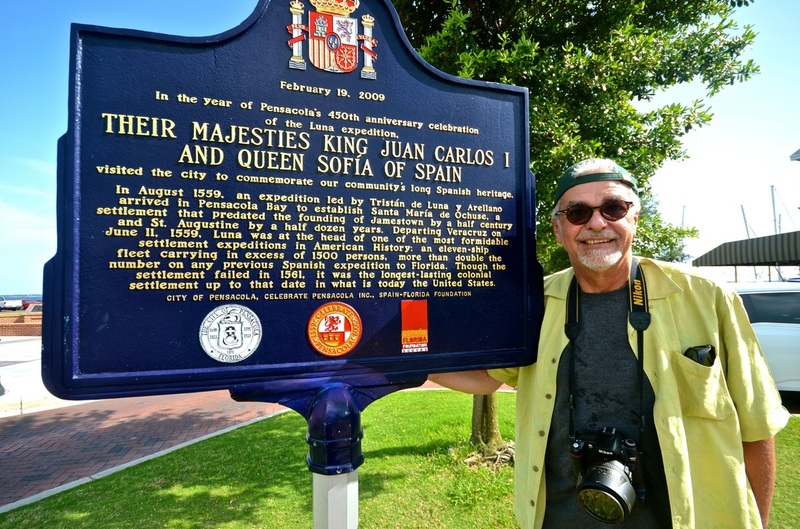 Everywhere you turn in downtown Pensacola, you see Spanish history and culture all around you. But we also went to the Bateria de San Antonio, the Spanish Water Battery at Fort Barrancas, a fortification built by Spain in 1797 to protect Pensacola Bay after recapturing the Pensacola area from the British and rebuilt by Americans in the 1840s. It's on a bluff — or barranca in Spanish — facing the harbor entrance, and it was used to fire cannonballs at enemy ships that tried to enter the harbor. Since Fort Barrancas is now part of the Pensacola Naval Air Station, we also got to see the majestic beauty of the Barrancas National Cemetery, where many Hispanic names can be seen among the pristine white tombstones. If you know where to look, Hispanic heritage is everywhere! Next week, this column moves to bayou country, where French and Spanish forces once competed for space and power, where another little-known Latino led victorious forces in the Civil War, and where our hidden Hispanic heritage needs to be exposed.